This Week, Party Static Got Moving. This past week, much of the local music buzz was dominated by the Dallas Observer's annual Music Awards ceremony, and the publication's music showcase that took over — and seemingly packed out — most every club in Deep Ellum this past Saturday. Perhaps the biggest beneficiary from these awards affairs was Party Static, which not only performed sets at the showcase and the ceremony itself, but pulled down the “Best New Artist” award and landed on the cover of the publication's print edition, which hit newsstands earlier today. It was enough, anyway, to land the bratty, over-the-top Dallas quintet its first ever No. 1 in our weekly local music power rankings. 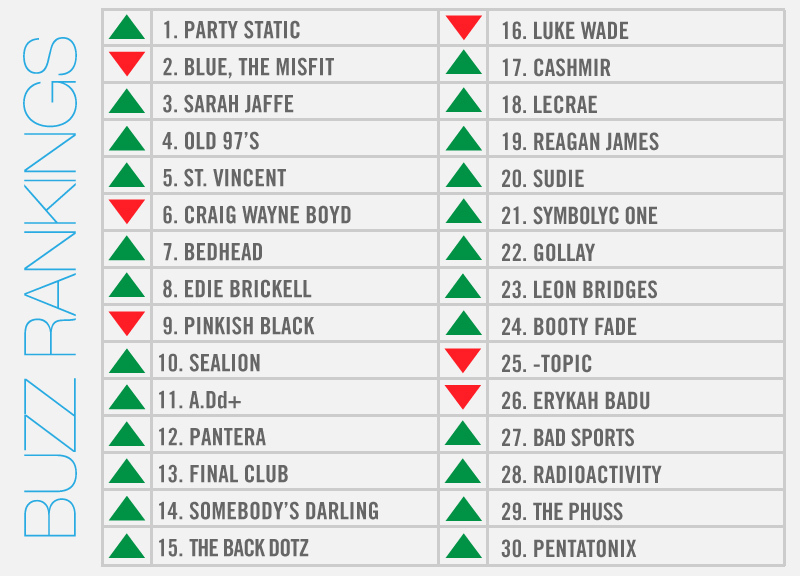 Just behind Party Static in this week's Buzz Rankings is last week's No. 1, Blue, the Misfit, who took home three trophies at those awards, headlined the showcase's biggest venue and graced the cover of last week's print edition. Then, there was Sarah Jaffe, whose “Don't Disconnect” was remixed by Grammy-winning producer Symbolyc One, and who also joined Weezer for a song at last weekend's How the Edge Stole Christmas concert. Symbolyc One also produced songs on a couple of this year's Grammy-nominated albums, too, which were announced late last week. Those included Lecrae's thrice-nominated Anomaly and Eminem's The Marshall Mathers LP 2. Similarly, Edie Brickell, St. Vincent, Pentatonix and MercyMe were all nominated for Grammys this year as well. Elsewhere: Old 97's will celebrate the 20th anniversary of its Hitchhike to Rhome LP this weekend, Dallas ex-pat Craig Wayne Boyd earned a spot in the final four on The Voice, Bedhead was the subject of a lengthy Grantland feature, Pinkish Black signed to Relapse Records and, ten years after his passing, Dimebag Darrell was in just about everyone's thoughts this week.